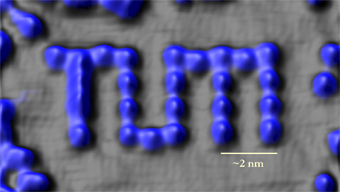 Generated by single atom manipulation: The TUM logo with a width of only 8nm written by arranging 26 CO molecules on the surface of a (111) orientated copper crystal. Since the beginnings of experimental physics new methods have been developed and sophisticated instruments have been built to allow scientific theories to be carefully tested. Here, the scanning tunnelling microscope is one such piece of equipment that allows such atom scale manipulation. In solid-state physics the fundamental properties of materials can often be probed using such microscopy techniques. Hereby, fundamental and far-reaching questions can be addressed related to different sub-fields such as magnetism, superconductivity, soft-matter, correlated electronic systems, quantum systems and semiconductor or nanostructure physics. Novel measurement and instrumentation methods, as well as special crystal growth and epitaxy systems are continually opening the way to break new ground and, therefore, are of central importance in condensed matter physics. Reflecting the great diversity of materials and systems investigated at TUM, laboratories in the physics department accommodate the most modern large-scale facilities and instruments that facilitate measurements at the very highest level. Furthermore, members of the faculty continually work to further develop and optimize instrumentation in all areas to maintain capabilities at the very highest level. 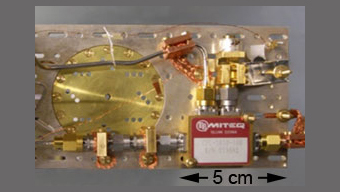 Apparatus for the measurement and analysis of extremely weak microwave signals at ultralow temperatures. Highly specialized experiments are needed to probe and resolve current questions in condensed matter physics. For example, ultrafast electronic processes and fundamental questions from quantum optics are probed using specialized laser systems capable of generating attosecond and femtosecond optical pulses. The manipulation and positioning of individual atoms on surfaces and exploitation of self-recognition and self-organization phenomena provides answers to fundamental important questions in surface physics. High-resolution scanning probe microscopy techniques open the way to developing a full understanding of phenomena on surfaces and, moreover, target the control of surface physical phenomena in order to design functional, low-dimensional nanostructures. Apparatus that facilitates cooling to ultra low temperatures and the application of extremely strong magnetic fields and pressure facilitate the exploration of the behaviour of solids under extreme conditions. State of the art spectroscopic methods facilitate the investigation of electronic transport phenomena in semiconductor nanostructures and low dimensional quantum systems. The most modern microwave measurement techniques facilitate the exploration and detection of spin excitations on the nanometre scale and the coupling of superconducting and semiconductor quantum circuits at the quantum limit of a single photons. The study of the smallest structures calls for big equipment: A view along the direction of flight of neutrons on their way to a detector in the small angle instrument at FRM II. The Heinz-Maier-Leibnitz neutron source (FRM II) provides a unique palette of instrumentation focused specifically on the use of neutrons to probe hard and soft matter. 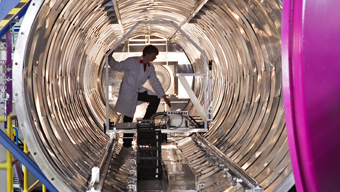 This partially unique infrastructure includes many different scattering methods such as neutron diffraction, neutron small and ultra-small angle scattering, grazing incidence scattering and reflectometry, high-resolution inelastic scattering and measurements with spin polarized neutrons. High-resolution tomography and time resolved methods complement the scattering techniques providing information about dynamical processes that occur over timescales ranging from picoseconds up to several hundred nanoseconds. In this way, researchers can study fundamental material and magnetic processes at atomic and molecular lengthscales. 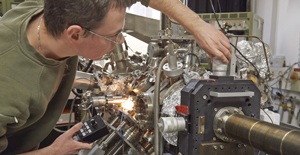 Besides neutrons, the FRM II laboratories accommodate the most intense positron source worldwide that can, for example, be used to perform Auger spectroscopy that yields important information about the electronic structure of the upper atomic layers of a solid. 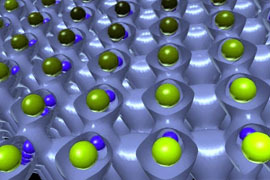 Theoretically calculated atomic configuration and electronic structure of a two-dimensional nano-lattice. The macroscopic physical properties of solids are determined largely by physical interactions that occur at the atomic and molecular range, i.e. over the nanometre scale. Despite the availability of powerful methods for experimental manipulation and study of materials over such lengthscales, many physical phenomena can only be understood with detailed theoretical modelling. Theory plays a key role in condensed matter physics insofar as it capable of predicting entirely new fundamental properties and, furthermore, it facilitates interpretation of experiments. 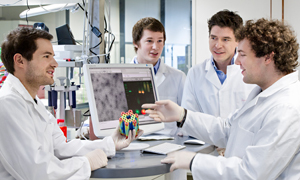 The theory groups in the Physics Department of TUM develop powerful theoretical methods allowing them to fundamental studies of quantum many body systems to develop a microscopic understanding of their properties, to develop predictive theories of the properties of modern nanostructures and to provide an understanding of complex phenomena in condensed matter systems.